Nobbing equipment removes the fishes head and tail and vacuum eviscerates the fish. The fishes belly is intact, and all the loose viscera has been removed. Pisces Nobbing machines are built out of stainless steel and FDA approved plastic. All the bearings, gearboxes and motors in the machines are stainless steel. The machines all feature variable drive pocket conveyor, which in able the speed of the machine to match the skill of the feeders. The PN-700 produces a head and tail off belly closed product. The PN-700 uses vacuum to remove the viscera. The machine operates between 100 and 180 fish per minute with two or three operators. 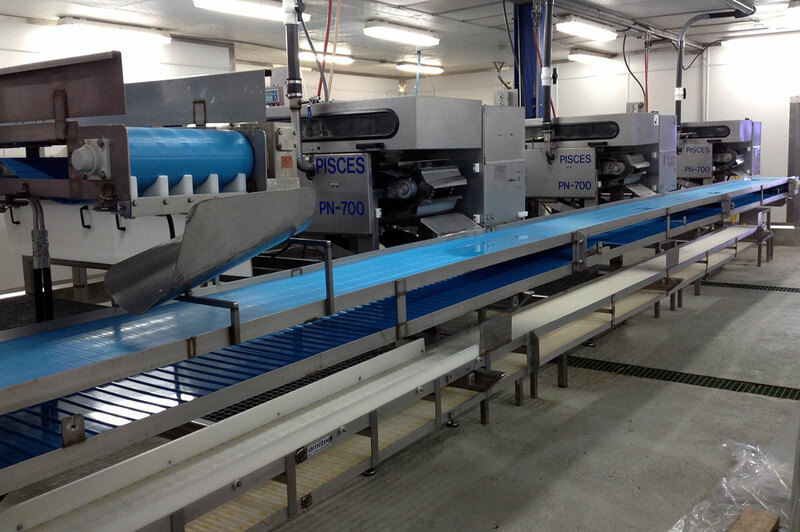 The machine can process fish up to 700 mm long. The PN-700 measures each fish individually and adjusts the position of the fish before the head cut. The machine has been used to process Pacific Hake, large Mackerel and other large pelagics. The PN-400 produces a head and tail off belly closed product. The PN-400 uses vacuum to remove the viscera. The machine operates between 180 and 300 fish per minute with two to five operators. The machine has been used to process Sardine, Mackerel, Herring and other under 400 mm in length. A cut to length option is available to ensure the fish is the right size for canning. The PN-200 produces a head and tail off belly closed gutted product. The PN-200 uses vacuum to remove the viscera. The machine operates between 180 and 300 fish per minute with two to five operators. The machine has been used to process Sardine, Anchovy, Smelt and other under 200 mm in length.